Suitable for: Interest level suitable for Years 2-6 (P3-7) (ages 6-11). Gold Book Band. Letters and Sounds Phase 5. 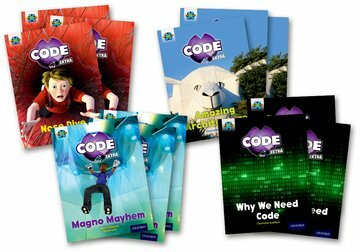 Project X CODE Extra introduces more exciting adventure stories and stimulating non-fiction texts into the Project X CODE series, to provide additional practice outside of the core intervention sessions. This pack contains 3 copies of each of the 4 books at Gold Book Band.